Takhyung Barwa, or the Blazing Fierce Guru, Hayagrīva and Garuda (Tib. བླ་མ་དྲག་པོ་རྟ་ཁྱུང་འབར་བ་, Wyl. 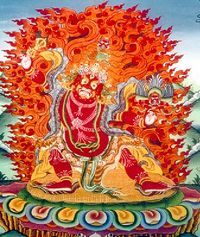 bla ma drag po rta khyung 'bar ba) — the great tertön Jikmé Lingpa received this terma at the age of 66 that combines the practices of Hayagriva, Garuda and Guru Drakpo. It is especially powerful for subjugating negative forces and overcoming diseases. English translation: The Blazing Radiance of Blessings, the Activity manual for the Wrathful Lama Takhyung Barwa, from the Longchhen Nynigt'hig cycle, translated under the directions of Chagdud Tulku Rinpoche by Richard Barron. Colophon: As part of the Longchen Nying’hig cycle of dharma teachings, this activity manual for the Wrathful Lama Takhyung Barwa was composed ex tempore, with suitable additional prayers taken from the Rigdzin and the Mother Consort Command (Yum-ka) sections of this cycle, as well as the interpolation of some of the verses of the seven-branch prayer and the chhad-t’ho. In order to facilitate recitation aloud, this was composed by the vajrayana practitioner Jigmed Mikyod Dorje, one who has been cared for by the aspirations formulated by the great omniscient one (Longchenpa) and who has seen some slight sign of this special deity. Jayantu! May it be victorious! Good fortune! English translation: A concise Daily Practice of the Wrathful Lama Takhyung Barwa, translated under the directions of Chagdud Tulku Rinpoche by Richard Barron. Colophon:This concise daily practice of yoga was extracted from the main terma manual of Kunkhyen Jigmed Lingpa. The additional prayers adorning the beginning and end were written by Chagdud Padma Gargyi Wangkhyug. This page was last edited on 1 June 2018, at 06:01.